Groundwater quality in the 12,103-square-mile Borrego Valley, Central Desert, and Low-Use Basins of the Mojave and Sonoran Deserts (CLUB) study unit was investigated by the U.S. Geological Survey (USGS) from December 2008 to March 2010, as part of the California State Water Resources Control Board (SWRCB) Groundwater Ambient Monitoring and Assessment (GAMA) Program’s Priority Basin Project (PBP). 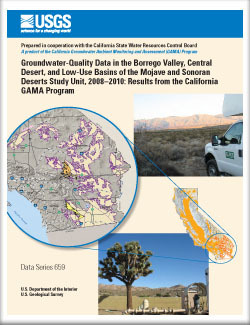 The GAMA-PBP was developed in response to the California Groundwater Quality Monitoring Act of 2001 and is being conducted in collaboration with the SWRCB and Lawrence Livermore National Laboratory (LLNL). The CLUB study unit was the twenty-eighth study unit to be sampled as part of the GAMA-PBP. The GAMA CLUB study was designed to provide a spatially unbiased assessment of untreated-groundwater quality in the primary aquifer systems, and to facilitate statistically consistent comparisons of untreated-groundwater quality throughout California. The primary aquifer systems (hereinafter referred to as primary aquifers) are defined as parts of aquifers corresponding to the perforation intervals of wells listed in the California Department of Public Health (CDPH) database for the CLUB study unit. The quality of groundwater in shallow or deep water-bearing zones may differ from the quality of groundwater in the primary aquifers; shallow groundwater may be more vulnerable to surficial contamination. In the CLUB study unit, groundwater samples were collected from 52 wells in 3 study areas (Borrego Valley, Central Desert, and Low-Use Basins of the Mojave and Sonoran Deserts) in San Bernardino, Riverside, Kern, San Diego, and Imperial Counties. Forty-nine of the wells were selected by using a spatially distributed, randomized grid-based method to provide statistical representation of the study unit (grid wells), and three wells were selected to aid in evaluation of water-quality issues (understanding wells). The groundwater samples were analyzed for organic constituents (volatile organic compounds [VOCs], pesticides and pesticide degradates, and pharmaceutical compounds), constituents of special interest (perchlorate and N-nitrosodimethylamine [NDMA]), naturally-occurring inorganic constituents (trace elements, nutrients, major and minor ions, silica, total dissolved solids [TDS], alkalinity, and species of inorganic chromium), and radioactive constituents (radon-222, radium isotopes, and gross alpha and gross beta radioactivity). Naturally-occurring isotopes (stable isotopes of hydrogen, oxygen, boron, and strontium in water, stable isotopes of carbon in dissolved inorganic carbon, activities of tritium, and carbon-14 abundance) and dissolved noble gases also were measured to help identify the sources and ages of sampled groundwater. In total, 223 constituents and 12 water‑quality indicators were investigated. Three types of quality-control samples (blanks, replicates, and matrix spikes) were collected at up to 10 percent of the wells in the CLUB study unit, and the results for these samples were used to evaluate the quality of the data for the groundwater samples. Field blanks rarely contained detectable concentrations of any constituent, suggesting that contamination from sample collection procedures was not a significant source of bias in the data for the groundwater samples. Replicate samples generally were within the limits of acceptable analytical reproducibility. Median matrix‑spike recoveries were within the acceptable range (70 to 130 percent) for approximately 85 percent of the compounds. This study did not attempt to evaluate the quality of water delivered to consumers; after withdrawal from the ground, untreated groundwater typically is treated, disinfected, and (or) blended with other waters to maintain water quality. Regulatory benchmarks apply to water that is delivered to the consumer, not to untreated groundwater. However, to provide some context for the results, concentrations of constituents measured in the untreated groundwater were compared with regulatory and non-regulatory health-based benchmarks established by the U.S. Environmental Protection Agency (USEPA) and CDPH, and to non-regulatory benchmarks established for aesthetic concerns by CDPH. Comparisons between data collected for this study and benchmarks for drinking water are for illustrative purposes only and are not indicative of compliance or non-compliance with those benchmarks. Most inorganic constituents detected in groundwater samples from the 49 grid wells were detected at concentrations less than drinking-water benchmarks. In addition, all detections of organic constituents from the CLUB study-unit grid-well samples were less than health-based benchmarks. In total, VOCs were detected in 17 of the 49 grid wells sampled (approximately 35 percent), pesticides and pesticide degradates were detected in 5 of the 47 grid wells sampled (approximately 11 percent), and perchlorate was detected in 41 of 49 grid wells sampled (approximately 84 percent). Trace elements, major and minor ions, and nutrients were sampled for at 39 grid wells, and radioactive constituents were sampled for at 23 grid wells; most detected concentrations were less than health-based benchmarks. Exceptions in the grid-well samples include seven detections of arsenic greater than the USEPA maximum contaminant level (MCL-US) of 10 micrograms per liter (μg/L); four detections of boron greater than the CDPH notification level (NL-CA) of 1,000 μg/L; six detections of molybdenum greater than the USEPA lifetime health advisory level (HAL-US) of 40 μg/L; two detections of uranium greater than the MCL-US of 30 μg/L; nine detections of fluoride greater than the CDPH maximum contaminant level (MCL-CA) of 2 milligrams per liter (mg/L); one detection of nitrite plus nitrate (NO2–+NO3–), as nitrogen, greater than the MCL-US of 10 mg/L; and four detections of gross alpha radioactivity (72-hour count), and one detection of gross alpha radioactivity (30-day count), greater than the MCL-US of 15 picocuries per liter. Results for constituents with non-regulatory benchmarks set for aesthetic concerns showed that a manganese concentration greater than the CDPH secondary maximum contaminant level (SMCL-CA) of 50 μg/L was detected in one grid well. Chloride concentrations greater than the recommended SMCL-CA benchmark of 250 mg/L were detected in three grid wells, and one of these wells also had a concentration that was greater than the upper SMCL-CA benchmark of 500 mg/L. Sulfate concentrations greater than the recommended SMCL-CA benchmark of 250 mg/L were measured in six grid wells. TDS concentrations greater than the SMCL-CA recommended benchmark of 500 mg/L were measured in 20 grid wells, and concentrations in 2 of these wells also were greater than the SMCL-CA upper benchmark of 1,000 mg/L. Mathany, T.M., Wright, M.T., Beuttel, B.S., and Belitz, Kenneth, 2012, Groundwater-quality data in the Borrego Valley, Central Desert, and Low-Use Basins of the Mojave and Sonoran Deserts study unit, 2008–2010—Results from the California GAMA Program: U.S. Geological Survey Data Series 659, 100 p.